The Thunder, presented by NJM Insurance, are pleased to announce several promotions and giveaways for the 2019 season at ARM & HAMMER Park. 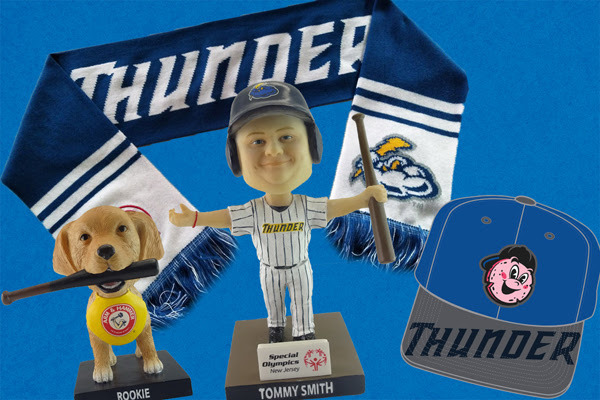 The marquee giveaways begin on Opening Night at ARM & HAMMER Park on Friday, April 12 against the Portland Sea Dogs when the first 2,000 fans, ages 14 and older, will receive a Thunder Scarf, presented by ARM & HAMMER. "Between our previously announced firework shows, bobblehead giveaways, our Thunder Pork Roll theme nights and these great promotions today, there will always be a ton of fun at the ballpark this summer," said Thunder GM/COO Jeff Hurley. "I think our fans will appreciate the extra layer of warmth in April with the Scarf on opening night and I'm thrilled to see the return of one of my favorite days of the year, Bark at the Park in August." Saturday, April 13 and Sunday, April 14 will feature baseball in sunshine with a 1:00pm start and a pair of great giveaways. The first 2,000 fans, ages six and older, on Saturday will receive a Thunder Mouse Pad Schedule, presented by the Mercer County Improvement Authority. Sunday will feature the first of many kids-themed giveaways throughout the season with the first 1,000 fans, ages 5-13, will receive a Kids Pennant. Sunday, April 28 will feature another great kids-themed giveaway on Hamilton Day at ARM & HAMMER Park. The first 1,000 fans, ages 5-13, will receive a Slice Frisbee upon entry. The month of May will feature a special day for Mom, a one-of-a-kind Pork Roll hat, and a youth jersey of a Yankees star given away as part of the 2019 promotional schedule. Sunday, May 12 at 1:00pm will be a day to remember with Mom when the first 1,000 women, ages 18 and older, will receive a Pink Thunder T-Shirt,presented by Aztec Graphics when your Thunder host the Portland Sea Dogs. A special Mother's Day Brunch will be served in the Yankee Club and Conference Center with a brand new menu in 2019. For more information on the Mother's Day Brunch, click here. The Thunder Pork Roll re-take the field for the first time on Friday, April 26, but, Pork Roll fans will want to be in attendance on Friday, May 17 when the Pork Roll host the Binghamton Rumble Ponies. The first 1,000 fans, ages 14 and older, will receive a Pork Roll Flash Hat, presented by Case's Pork Roll, upon entry. A hat that pork roll enthusiasts will certainly enjoy, shows an outline of Thunder Pork Roll mascot Slice when worn in natural light, but, when photographed with a flash illuminates the outline of Slice and the brim of the hat. Sunday, May 19 will be a spectacular day for kids at the ballpark when the Binghamton Rumble Ponies (New York Mets) and Thunder hook up for a 1:00pm start. The first 1,000 fans, ages 5-13, will receive a Miguel Andujar Replica Jersey upon entry, presented by Penn Medicine-Princeton Health and Children's Hospital of Philadelphia. The 2016-17 Thunder infielder was the runner-up in AL Rookie of the Year voting in 2018. Previously announced giveaways for April also include a Miguel Andujar Bobblehead Doll and the return of the Thunder Pork Roll featuring new uniforms. The month of June at ARM & HAMMER Park will be filled with sunshine, six fireworks shows, a pink logo baseball giveaway and one of three days in which fans can bring their dogs to the dog-friendliest ballpark in minor league baseball. The first 1,000 women, ages 18 and older, will receive a Pink Baseball on Friday, June 7 as part of Breast Cancer Awareness night, presented by Radiology Affiliates Imaging when your Thunder host the Erie SeaWolves. A great month of fun will finish off with a flurry of giveaways with a special Hometown Heroes Card Set Giveaway, on Thursday June 27 when the first 1,000 fans ages six and older, enter through the gates. The card set giveaway and post-game fireworks set to a patriotic theme are presented by Wells Fargo. Friday, June 28 will send the first 1,000 fans, ages 21 and older, home with a Bonesaw Brewing Beer Koozie, perfect for keeping your drink cold throughout the summer. Sunday, June 30 will be a great day for kids at the ballpark as the first 1,000 fans, ages 5-13, will receive a Gleyber Torres Replica Jersey, presented by Berkshire Bank. Rookie, the third-generation of The Family Business, will be part of three special nights when fans can bring their dogs to the game in 2019. It all startes on Tuesday, May 21 when the first 1,500 fans, ages 14 and older, will receive a Rookie Bobblehead Giveaway, presented by ARM & HAMMER, on Bat Dog Celebration Day. On Monday June 24, when the Thunder host the Reading Fightin Phils (Philadelphia Phillies), the first 1,000 fans, ages 14 and older, will receive a Rookie Travel Pillow, presented by Nutri-Source Pet Foods and the Valley Forge Tourism & Convention Board, and all fans can bring their well-behaved dog to the game, free of charge. The team's annual Bark At The Park, presented by Dogs & Cats Rule, will take place on Sunday August 11 when the Thunder take the field for a 5:00pm first pitch. The month of July will feature the largest fireworks show in Mercer County on Thursday, July 4 when the Thunder host the Hartford Yard Goats as part of a month jammed with fun. Friday, July 5 will be a lucky night at the ballpark with the team's annual Irish Heritage Night presented by the New Jersey Lottery. The first 2,000 fans, ages 18 and older, will receive Instant Lottery Tickets upon entry to the game. The July 4 weekend wraps up with post-game fireworks on Saturday, July 6. The 2019 season will begin in Erie on Friday, April 5 at UPMC Park. Opening Night at ARM & HAMMER Park will take place on Friday, April 12 against the Portland Sea Dogs (Boston Red Sox).